Any form of theatre that has to do with puppets seems to exert a great fascination for children. More than adults, they seem to quickly suspend their disbelief, and join the puppets in the fantasy world that is created on stage. Sidhvi, 6 yrs, standing in front of me in the queue, was very excited; “I have seen many plays at Ranga Shankara, I’m looking forward to this one!” she said, with a big smile. 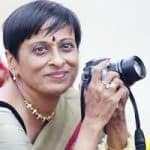 Since Ranga Shankara had advertised “Pacotille”, by Cie Crea, as a play for “kids above 5 years”, I went,too, full of eagerness to experience the production. The lighting and the music, for both of which credits were not given, were very good indeed. In fact, the lighting completely masked the area behind the park bench which was the centre point of the stage set, and it surprised the audience when a gloved hand came out and started messing with the Charlie-Chaplinesque vagabond’s suitcase and papers, and provides the red box that created much of the narrative. There were plenty of props that were used; a flower, the red box, several things that came out of it (illuminating it from the inside was a nice touch). The street light at the edge of the stage remained a constant, and contrary to my expectations, did not play much of a part in the proceedings. The puppets deserve a special mention. Made from old clothes, which the cast wore as a “front”, the heads of the puppets were papier-maiche, and held before the cast members’ faces by their left hands. Every puppet, therefore, was a one-armed, right-handed puppet. I was led to speculating why the masks, instead of being worn on the head, were held in front of the face. Also, the marks were not easily recognizable as human or animal or just plain fantasy. Children in an audience who have come to watch puppets are in the mood to be entertained, and ready to laugh whenever the opportunitiy arises. However, the narrative was abstruse and abstract enough to keep them from doing this. Why the vagabond gives the red box away so easily after coveting it and bemoaning its loss, was not clear to us. The planting of a seed, the caging of a bird…all these did not seem to hang together, and the audience were left guessing at what the import could be. 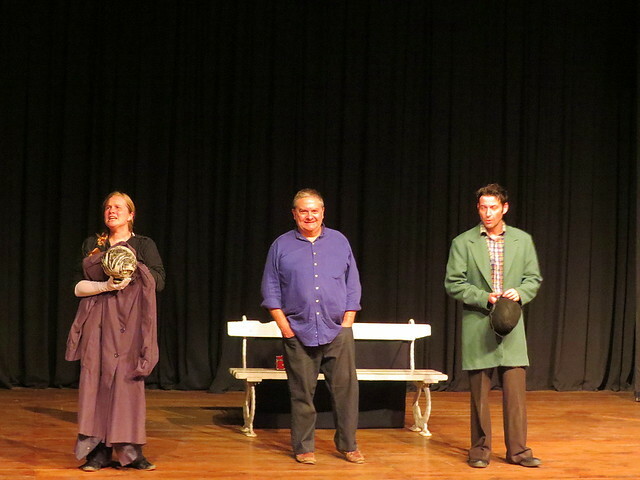 It was strange to see an audience full of children, hardly laughing or reacting to the play. However, at several points, the cast did involve the audience, pretending to believe that one or another spectator was the thief of the red box. Two children were also invited up on to the stage, to interact with the narrative. In spite of this, much of mime seemed very trite, and the pace tended to drag at times. There was no doubt about the experience and expertise of the puppeteers. Aude Maréchal, as a director, actress and puppeteer, has mainly been trained at the Papillon Noir Theatre and the Ecole de Théâtre in Paris, and she has worked in several other countries. “Pacotille” was a play she produced internationally in 2008. Fanny Potel has been an actress and a costume designe since the age of 7. She’s worked with directors, mainly from Normandy, and has also taken a 2-year theatre course at the Conservatoire in Caen. Alas, my lack of ability in following French pronounciation prevented me from getting the name of the director of the play, who joined the puppeteers on stage after the show. That brings me to the other problem that my fellow spectators and I faced: the lack of any brochure, that would have told us a little about the puppeteers, the director, or the production. 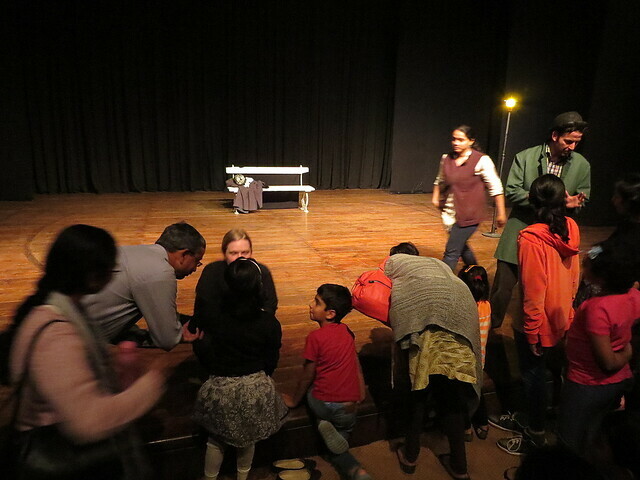 Though the puppeteers did invite a chat session after the show, it was mainly the children who wanted to go and touch the puppets for themselves who went up on stage. In all, therefore, the experience was less than satisfying (and somewhat mystifying), even though the characters, and the audience, were (literally and figuratively) in the hands of expert puppeteers throughout.